Puppies are very playful animals regardless if you have a little Jug like us or a massive St. Bernard’s dog. They’re just making their way through life with their bundles of energy. Just like human babies, Puppies are constantly learning and want to do everything all the time – they are also growing rapidly! One of the main features of a growing puppy is of course their teeth! Puppies have sharp teeth when they’re young which need constant maintenance, their adult teeth are not that far behind as well which creates a lot of discomfort in a young pup, they can chew all day long! What is the difference between an adult and puppy toy? What makes a good puppy toy? Kong make great toys for all stages of the dog’s life. The Kong puppy version is essentially just a smaller one. Made of tough rubber, the kong is shaped in such a way where you can put treats like peanut butter or Kong’s on paste in there and the pup has to work really hard to get their young in there. This is a favourite of our Jug, Jeff and we’ve been through two now in the two years we’ve had him. Longevity, robustness, fun, engaging and good for oral health you really can’t go wrong with this great puppy toy. 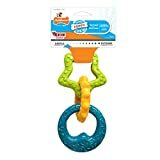 The Moonkey treat dispensing puppy toy is similar the Kong toy where it rewards your pup for solving a simple puzzle. It’s also a very good toy for cleaning their teeth while they’re at it. The bright and vibrant colours will get your pup’s attention and the mechanism inside will keep it for hours and hours. Made of strong, non-toxic plastic you can be safe in the knowledge that your Pup’s digestion is catered for. Nylabone make great toys, we’ve had quite a few of their toys for our dog through the years. While Jeff was a puppy we had the teething rings which kept him happy while his teeth were coming through and giving him grief. Cheap, simple design and strong to withstand everything he had to throw at them. Another entry from the fabulous Kong company is the tug dog toy. Tugging toys can help exercise your dog as well as a toy that gets both the owner and the dog involved to help improve their bond. Has a good grip, made of non toxic materials and made of colour! Have a anxious pup or planning to bring a super young pup home soon? 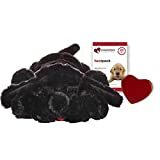 The smart love snuggle puppy comforter has a warmth to it and can mimic heartbeat which can keep them calm in the early days of their lives. This is not really designed for chewing just to keep them calm in their bed or dog cages and crates. Quite expensive, but can be worth it if you do have a worrier. Kong once again! This time it’s with a cuddly and tough bear toy. Has a rope skeleton which makes it quite tough when compared to other toys of its kind, the squeaker is also in there which can keep them wanting more as it brings out their natural instinct to destroy. Quite on the expensive side but can help a great deal if you want to vary the types of toys your puppy has. There is a lot less stuffing inside so there’s very little mess when your pup finally conquers this toy. 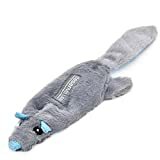 This excellent low activity chew/cuddly/calming toy for puppies is designed for carrying and cuddling and ideal for docile pups or those who are seeking comfort. Can be chewed and has a squeaker for when they fancy a nibble. Ideal for quite times in your house as the door can soothe their natural instincts of catching prey (it’s shaped like a mouse) and not cause a mess! Guys, it doesn’t get much more fun that the hide and seek squirrel toy by Outward Hound. Does your pup chase squirrels in the park? If so, this is going to be a blast for them and for you. Watch how your pup gets excited to get the squirrels out of the hole just for more and more to come out. Prolong it for as long as you can by putting the squirrels back in. Can use this as a training aid to teach your pup to ‘drop’ its ‘prey’ over and over which can help a lot if the situation ever arises where they catch a real living animal someday. Comes in a wide range of shapes, noises and sizes to fit your dog. Durable and easy to clean. The Tornado Interactive Puzzle Mental Stimulation Brain Game by Nina Ottosson is a sight to behold. Even though it looks more like a toy you’d get for a toddler it in fact an intricate puzzle toy for puppies and dogs. By placing treats inside the containers the dog needs to spin them to find them. But there’s more! You can place blockers on top once they’ve got the basic grasp of it to make even more challenging. Your pup will have to work very hard and use their brains to get some treats while you can sit down in delight watching them be engrossed and engaged. This toy is not suitable to be used non stop as it can get boring. Try bringing it out once every few days for a short time so they have to relearn everything again – it’s an expensive toy so it’s better for everyone that way. If you have an aggressive chewer, many people, then you can’t go much wrong with the oneisall indestructible bone shaped chew toy. It’s made of extremely durable rubber that’s non toxic so you can be safe in the knowledge that if they do get some chunks off they’ll be ok. The bone chew also has a slight bacon flavour so that your dog will get some taste while cleaning and taking care of their gnashes. 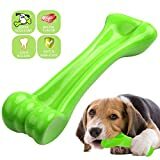 【INTERACTIVE TRAINING TOY】The bone chew toy is one of the dog's favorite toys and easy to attract dog's attention and smell good to arouse dogs' interest to solve the boredom and reduces anxiety. Promote our relationship with dogs. The dog biting pack is more of a convenience and money saver than anything else as you get 5 different toys which come in a clear bag. This gives a good variance for your UK pup and you can rotate the toys as soon as they start getting damage giving you a fairly long lasting solution. Made of safe, non toxic cotton fibre, like a rope, which improves the toughness. Probably best for not so aggressive chewers. ★100% Safe Cotton Fiber - Made of nontoxic and high quality durable natural rubber material, it is bite-resistance. Safe and soft and comfortable for teeth cleaning and gums of your pets. In heavy-duty construction and long-lasting strength. No plastic or rubber composition, environmental pollution-free, safe to play alone. Built for long lasting chewable and washable, which prevents bacterial breeding if regularly being cleaned. ★Helpful Teeth Cleaner - Braided cotton toys assists to clean up dirt hidden in dog teeth and train biting force by contact friction when your pets are chewing, effectively promoting the healthy growth of teeth and gums. When the dog chew the rope cottontoys, which can clean the dog's teeth, improve dental health, reduce dental calculus and other diseases. ★Joyous interaction - Satisfy dogs' instinctual needs and strengthen the relationship between dogs and their owners. Alleviate separation anxiety, promote proper chewing behavior and correct misbehavior. Keep your dogs happy, healthy and entertained. Available for both indoor or outdoor playing or training, better enhance bond between you and your lovely pets. Creating healthy and funny playing between your pets and you, also training your pets IQ. ★Protection for Your Furniture - To solve the pet bite things randomly, barking, improve restlessness and increase a sense of security of dogs. 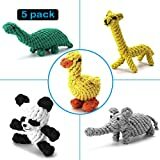 The colorful dog toys easily draw your dog's attention, reducing dog bites of sofa, socks, shoes, tissue, paper, table leg or others. Assist to discourage destructive behaviour and chewing of furniture. Breezily get you out of clutters! 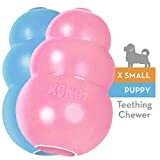 Whether you get them a good toy or if they just find your favourite pairs of shoes so it’s important to get great toys for your puppy which ticks all of the right boxes to keep their mouth healthy, keeps them safe from choking or ingesting toxic materials and of course a toy that not only keeps them occupies but their mind engaged. In all honesty, there isn’t much difference between an adult toy and a puppy toy. 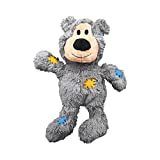 However, in our opinion a puppy toy should be much more fun, colourful and engaging to really test their growing minds and help them develop and enhance their problem solving skills and their joy for toys themselves. If you give your puppy great toys when their young they will likely enjoy toys when their older which can help owners to distract them if need be in later life. All of these toys server a different purpose and although it can be expensive to get a lot of toys considering a puppy itself is expensive enough it is a good idea to have a broad range of accessories and playthings. Along with chewing, puppies can often swallow and consume parts of a toy if it’s the type that wears away and breaks apart. This can often not be avoided so try to buy puppy toys made out of non-toxic materials, so even if they do swallow some of the toy no harm will come from it. While their young, it’s important to train your dog. We’ve written extensively about this. But, did you know you can get toys for your pup that can really test their brains? These are some of our favourites – the sorts of toys where there may be a treat inside and the young dog has to perform a specific action or solve a basic puzzle to get there. Keeps them entertained, thinking and has a reward at the end! This is a feature more for the owner – puppies can chew non stop – if you get a puppy toy that isn’t strong you may find yourself having to buy new toys over and over again which can be very expensive. Look for toys that will last you a long time. A good toy should be shaped in a way that it cleans their teeth while they have at it. Not all puppy chew toys are like this so try and rotate them so that they get time with the clean teeth specialist toy from time to time. Perhaps the most important feature from the perspective of the pup is that the toy is fun to play with, has a cool shape and vibrant colours to grab their attention! So without further ado, we at JugDog.co.uk are going to share with you our opinion on the Best Puppy Toys currently available in the UK!